It is very easy to implement the Montessori Method at home. All of Dr. Montessori’s work was based solely on observations of the child in his or her environment. 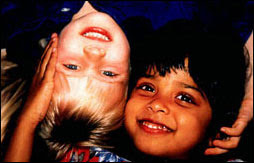 Dr. Montessori viewed the child as the future adult and, like adults, the child’s personality, thoughts and movements all depended on the early environment – or the home environment. The early environment should reflect the individual needs of a child. It is important to realize that Montessori was the name of a person. Dr. Maria Montessori was a physician from Italy who observed children in her care. Dr. Montessori developed a teaching method based on her observations. This teaching method is what we refer to as “Montessori”; and it is important to remember that this is a teaching method, not a philosophy. In a Montessori classroom, the teacher is not the center of attention, but, rather, an observer. The Montessori teacher is referred to as the “adult” and only directs classroom activities when the children need assistance. Children in a Montessori classroom are encouraged to work in groups or individually. When in groups, children are encouraged to work collectively, by working together to resolve issues. If there is a difference of opinion or a conflict between children, they are encouraged to resolve their issues on their own. If the adult is required to intervene, he or she helps the children work through the problem by stating the facts and never taking sides. The autonomy of the child in a Montessori classroom teaches the child independence and increases self confidence. Teach your child to appreciate their surrounding by taking walks together, exploring your back yard, watching the sunrise and sunset, or gazing at the stars. Take walks throughout the year, allowing your child to experience the characteristics of the different seasons. Most importantly, don’t forget to enjoy the time you spend with your child. Before you realize it, your child will be all grown up!